Exactly why composer Andre Tchaikowsky – gay, Jewish and depressive – chose The Merchant of Venice, with its heavy-handed anti-Semitism, as the basis of his only opera is hard to fathom. Perhaps the play’s focus on Shylock, the scorned outsider, resonated with Tchaikowsky, who as a child survived the Warsaw ghetto thanks to his exceptionally determined grandmother. After the war, she propelled him into an international career as a concert pianist and composer. In 1981, a year before his early death, he took The Merchant of Venice, his only opera, to the English National Opera. They weren’t interested, and the opera didn’t receive its world premiere until 2013, with the Welsh National Opera giving the first UK performance in Cardiff in 2016. 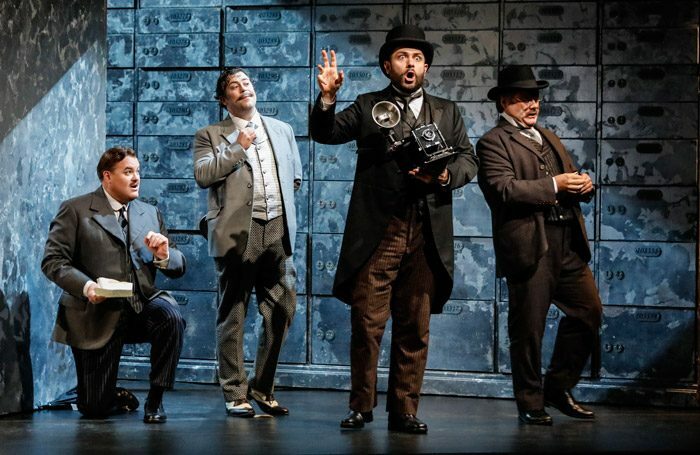 Most of Cardiff cast reprise their roles in this London premiere. African-American baritone Lester Lynch richly deserves praise for transcending caricature with pathos and power, both vocally and dramatically, in the pivotal role of Shylock. Tchaikowsky’s music is solidly mid-20th century, with traces of Stravinsky, Prokofiev and Britten, and it’s incisively played by the WNO orchestra under Lionel Friend. There’s an sharp shift from the twittery, nervous music of the first two acts to a greater lyricism in the third act, when eloquent arias roll in one after another. This opportunity is effectively embraced by, among others, Sarah Castle as Portia and Mark Le Brocq as Bassanio, with a commendable effort by Martin Wolfel as Antonio, but his countertenor has trouble projecting over the large orchestra, a misjudgement to be blamed on the composer. Visually, designer Ashley Martin-Davis makes a sharp contrast between the dark soul-less business world of Venice and the playful, soft world of Belmont. The costumes harken back to early 1900s, bringing to mind Britten’s Death in Venice, though this period nostalgia is disrupted by Nazis and a top hat-wearing Marlene Dietrich character.